A reader posits: If presidents are so completely bound, can we really blame them for being complicit? Isn’t voicing soul and decency at least superior to abandoning it altogether? Or, as you say, is it better we face the monster unmasked, as we are doing now? These are precisely the inquiries that lead to the kind of soul work – for ourselves and our world – that I’m trying to provoke. And of course, struggling with them is more important than answering them. 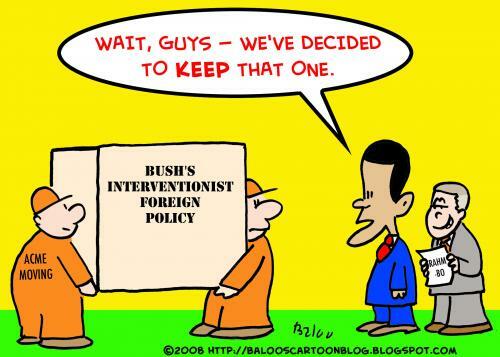 Just as with his economic policy appointments, Obama’s initial pick of cold warriors Robert Gates and Hillary Clinton signaled that there would be no change in foreign policy from the Bush years. He came into office making two promises: to end the Iraq War, which he dismissed as “the stupid war,” and to win in Afghanistan, “the necessary war.” But he retired having been at war longer than any president in U.S. history, and the only president to serve two complete terms with the nation at war. One could certainly frame his domestic and financial decisions, harmful as they were, as part of the old liberal story, as well-intended failures – a phrase, by the way, that conventional historians used to describe the mad, genocidal atrocity of the Viet Nam war and now use to describe both the Iraq and Afghanistan wars. But even a cursory investigation of Obama’s foreign policies reveals his true roles – the functions he was originally vetted for – in maintaining the influence of the American empire and restoring faith in American innocence. Any honest discussion of American foreign policy in this century must begin with 9-11. We don’t need to argue about whether it was an inside job or whether the Bush administration had prior knowledge of the impending attacks; after 15 years you have your own opinions. My own writings on the matter have always tried to focus on its implications for the myth of innocence – how Americans responded to it. But few can deny that Bush’s crowd happily used the tragedy and manipulated public opinion to support their imperial aims in the Mideast. And few can deny that this included how the “intelligence community” (the same people now put forth as Trump’s noble opponents) lied to justify invading both Afghanistan and Iraq. What did Obama do after inheriting these policies? He served George W. Bush’s third and fourth terms. Whatever you think about 9-11, it is abundantly clear that Saudi Arabia provided operational and financial support to the hijackers and that the U.S. government – half of that time on Obama’s watch – covered up that fact for fifteen years. In July of 2016, when the infamous 29 pages on ties between the hijackers and Saudi officials were finally made public, Obama’s only response was that he stood by the investigation of the 9/11 Commission. 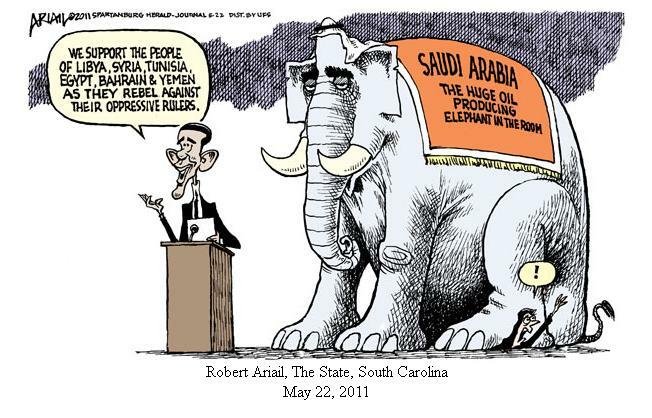 And in October, he vetoed the “Justice Against Sponsors of Terrorism Act” that would have made it easier to sue Saudi Arabia for its complicity. For eight years, he criticized Syrian despotism but ignored Israeli, Saudi and Qatari repression, misogyny and religious intolerance at home and warmongering throughout the region. How do we re-invigorate outdated myths? In 2012, he put his personal stamp on the narrative of American exceptionalism by announcing a 13-year, $65 million commemoration of the war against Viet Nam, praising the veterans who had been “fighting heroically to protect the ideals we hold dear as Americans.” So much for learning from the past. …a secret force (functionally the president’s private army) cocooned inside the U.S. military – now at almost 70,000 personnel…carry out operations almost entirely unknown to the American taxpayers…far from the scrutiny of the media or meaningful outside oversight of any kind. Everyday, in around 80 or more countries that Special Operations Command will not name, they undertake missions the command refuses to talk about. We have no strategic plan. We never had one. – Anonymous senior military commander. Let’s get some terminology straightened out. When we hear the phrase “intelligence community”, please substitute “the CIA, which has been overthrowing democracy everywhere for seventy years”. And when we hear about “private defense contractors” we are really being told about mercenaries who are paid far more than regular soldiers. The original impetus was, ostensibly, to punish the Taliban government in the wake of the 9/11 attacks for harboring Al Qaeda. Yet it would be hard to define why we are there now except for the imperatives of U.S. hegemony and military empire. People get rich from war, legally or otherwise. Lest we forget, Afghanistan is (not was) the longest war in U.S. history. We hear little about it these days because it is overshadowed by conflicts elsewhere – and because there have been more contractors than U.S. troops there since the middle of 2011. Their deaths and injuries are not part of the official count, which accordingly appears smaller than it really is. 117,000 contractors and 88,000 U.S. troops were deployed there in 2012. 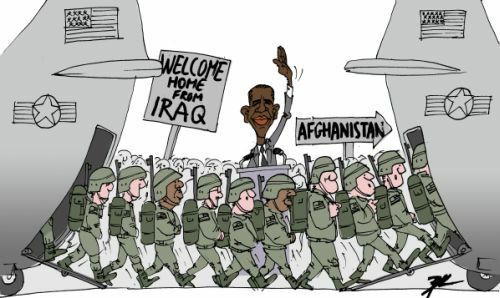 As of March 2016, there were still approximately 28,600 contractors and 8,700 U.S. troops, despite Obama’s claim in December 2014 that the U.S. military’s combat mission in Afghanistan had come to a “responsible conclusion.” From 2007 to 2015, the U.S. spent roughly $220 billion for private contracts there and in Iraq. By that point, over 1,600 Americans had died in Afghanistan since he had taken office — well over half of all the dead during the entire war – along with countless Afghans. Over 115,000 troops were suffering from traumatic brain injuries and half a million had applied for disability benefits. Some three million Afghans are refugees. Tens of thousands have attempted to enter Europe, and thousands have drowned trying. The Taliban control about 10% of the population and half of the land, more than at any time since 2001. Only about half of the 1.5 million guns given to the Afghan government can be accounted for. The war killed 3,500 civilians in 2016, the highest toll since 2009. Nation building? The U.S. was spending $100 billion annually on the war and only $2 billion on sustainable development, much of that siphoned off by the corrupt Karzai government. And then there are the drugs. Since the American invasion began, heroin production has increased 40 times. And, since a million people worldwide have died from Afghan heroin since 2001, I invite readers to investigate the long history of the CIA’s involvement in the drug trade. Barry, ye of hundreds of strong, brilliant, seldom-said facts, post after scores of posts (including this one), please don’t assuage the American “innocent eyes” who want to believe that in the afternoon of 9/11, WTC 7, hit by no plane (or other flying object) collapsed at free-fall speed because of minor fires. Please don’t fail to mention Dr. Judy Wood, pilots, architects and engineers for 9/11 truth, the huge insurance payoffs to the new owner of the asbestos-filled WTC buildings, etc., etc. Please. A broken clock gives the correct time twice a day, like the other-wise reprehensible Alex Jones, is correct about part of 9/11. Well said, Dale. I agree with all you’ve said. I’ve pointed out in previous blogs that the nation experienced a military coup in November, 1963 and a second one in September, 2001. Still, my personal interest is in the mythic background that makes us so innocently willing to believe our stories. Sadly, hearing the facts usually doesn’t change those stories, whether among Trumplodites or among liberal gatekeepers. That’s our challenge: some of us need to keep pointing out how the old stories no longer serve us, while others need to experiment with telling new stories.